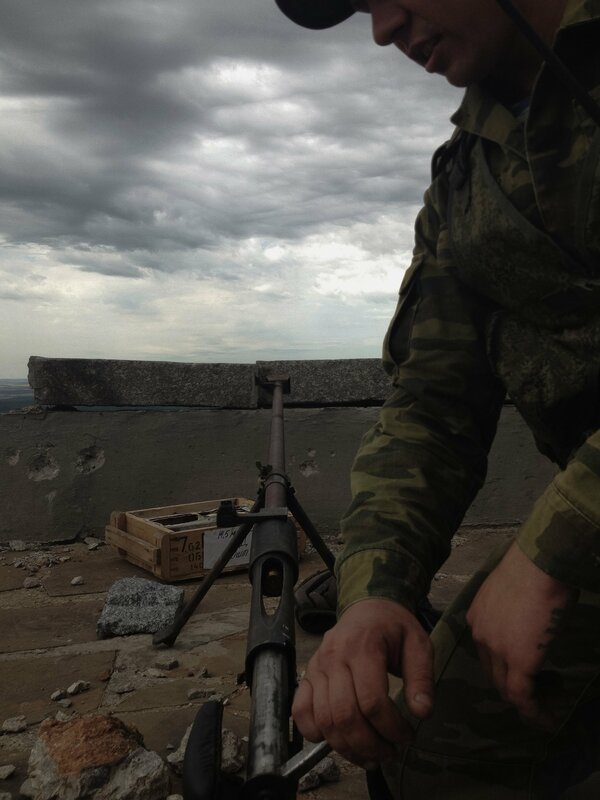 "No way in hell we'll lay down our weapons while the fascists are still around"
SAUR-MOGILA—From the base of a big stone obelisk, the soldiers scour the valley below their hill. They look out from army green binoculars with chipped paint and a hammer-and-sickle insignia. They see fascists and Nazis, and they say they will fight to the death. They set up a rusty rifle, stamped "1942," and send a volley into a cluster of trees. They watch smoke rise. They laugh. "No way in hell we'll lay down our weapons while the fascists are still around," says one of them, a burly man named Gena. This is not 1942. It is 2014, just two days after the tragic downing of Malaysia Airlines Flight 17. 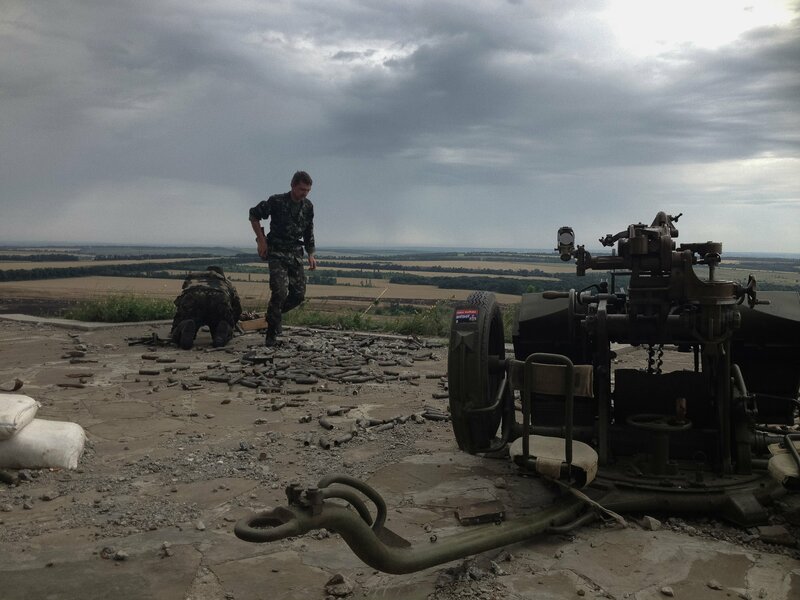 I am standing on Saur-Mogila, one of the highest points in eastern Ukraine's Donbass region, with a group of pro-Russian separatists who have been fending off attacks on this position from government forces since May. Western intelligence suggests that the missile that struck the plane came from somewhere in the fields further down. But to the rebel fighters here, it might as well have come from Kuala Lumpur. They are at war with Kiev and its Western allies, and the plane crash is an enemy plot. They've gotta hold this hillside, dammit. This hill is "a sacred place," adds Gena, who, like all the fighters interviewed, gave only a first name. Here, the Soviets pushed back Hitler's army, losing some 23,000 troops along what was called the Mius-Front. During peacetime, local kids search Saur-Mogila ("Hill 277.9" to the Germans) for traces of World War II—old ammo, knives, pistols, rifles, helmets. A monument now towers over everything, an obelisk more than 100 feet tall with an attached cast-iron statue of a "soldier-liberator" raising a gun in triumph. The rebels have raised a Russian flag atop the tower, and the Ukrainians have sent a bullet through the statue's heart. For the separatists, they are following in their forefathers footsteps. "In World War II our grandfathers held this hill, and now we too are holding it," says Andrei, a member of the Vostok Battalion, a powerful rebel militia. There was hope that the tragedy of MH17 would force Russia, Ukraine, and the rebels to wake up from their post-Soviet fever dream. But following the crash, the parallel realities that exist across eastern Ukraine only became sharper. Prospects for peace have all but disappeared. Among rebels, blaming the Ukrainian forces for downing MH17 is an article of faith. Most locals (fed by the Russian media) agree, seeing it as a plot concocted in Kiev to discredit the separatist movement. And the Ukrainian forces, meanwhile, have pressed their offensive further, both at Saur-Mogila and around the cities of Donetsk and Luhansk. When I first arrive at Saur-Mogila, travelling with two colleagues, I notice craters alongside the road leading up to the peak. Ahead are tank tracks, and the asphalt street is split with a big silver shell. All around, dirt and debris and the detritus that speak of airstrikes. Above, at the top of the hill, a pack of rebels mill about. They look like giants from below. But they descend to meet us, and turn out to be small and scruffy. 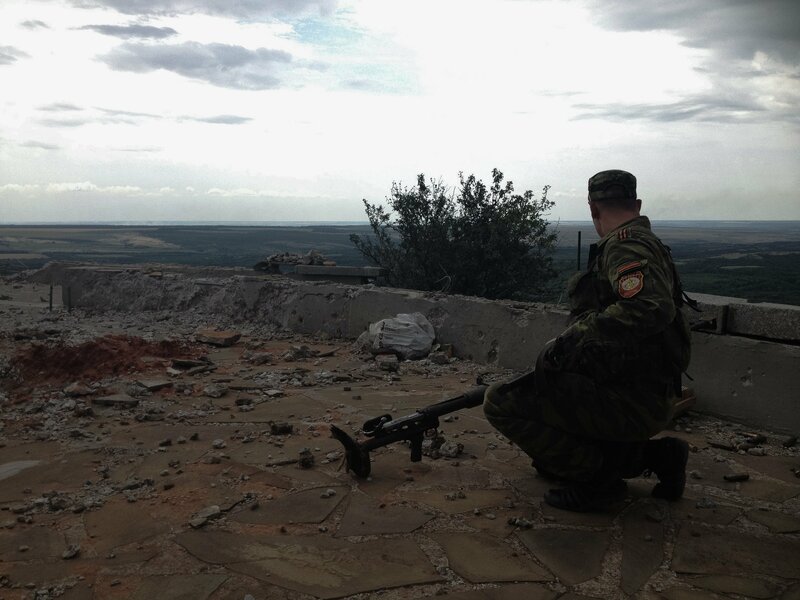 The encounter is emblematic of the war in Ukraine: fought from afar against inhuman opponents. Neither side wants to look the other in the eye, because to do so would be to acknowledge that, for the most part, they aren't fighting Nazis and terrorists, but neighbors and countrymen. When Hitler and Stalin had it out here, George Orwell wrote of a force that he called “nationalism.” He did not mean allegiance to a nation-state though, but the conviction around which one can construct a reality. "Having picked his side, [the nationalist] persuades himself that it is the strongest, and is able to stick to his belief even when the facts are overwhelmingly against him," Orwell writes. "Nationalism is power-hunger tempered by self-deception. Every nationalist is capable of the most flagrant dishonesty, but he is also—since he is conscious of serving something bigger than himself—unshakeably certain of being in the right." This is what is missed about the war in Ukraine: Behind the high-profile Russian agents who lead the separatists are scores of men, mostly locals, who believe—truly, madly, willing-to-die believe—that they are doing the right thing. These are not the mustachioed villains you see on television. These are factory workers and mechanics who now man checkpoints and lead military operations. The world they live in is filled with fascist threats from far-away lands. It is a world constructed largely on the basis of baseless Russian propaganda—easy to scoff at, but for these men, it's real. The gold-toothed commander at Saur-Mogila, Niloka, leads us up the hill, weaving around the craters. "To the right of us, a kilometer out, they're there," he says, pointing up beyond the monument. He chats on a walkie-talkie, barking commands with the assurance of a seasoned fighter: "That's it, got it. I give the order: fire." Black wires run through the grass. Field telephones, they tell us, Soviet antiques, TA-57s, like the ones their grandpas used. He brings us up to a set of small stone buildings, past a soldier cooking soup on an open flame, and down into a bunker. Two rounds of Grads rockets hit somewhere on the other side of the hill—they are fired in an immediate series and land rhythmically, like a bad dubstep baseline. In the bunker we sit on a brown leather couch. Belts of machine gun ammunition fill wooden crates on the floor. Two sleeping pads—one silver and the other camouflage—lie against the far wall. On a messy table stands a can of stewed meat, opened but only half-eaten. They've taken over an entertainment complex that used to welcome tourists to the monument—it once had a bar, a cafe, even a banya. Since mid-April war has crept slowly into the Donbass, filling the sunflower fields and the steppe. Once, in between rounds of shelling last month, a young couple drove up this hill in a Mazda, perhaps looking for somewhere to watch the stars. They didn't know that their make-out spot had become a regular battle site. The men here remain resolute, their speech a mixture of banter and braggadocio. They repeat the now familiar litany of complaints about cultural and religious assault, language rights, and western-sponsored "juntas." They have no plans to back down. “My comrades have already died in this war,” says a fighter named Roma, with black aviators perched on his cap. Outside the bunker, I run into a Maksim, a young fighter from the town of Druzhkovka, north of Donetsk. We first met nearly three months ago in Slovyansk, around the time he and his dad enlisted in the militia together. Back then, he was kind-eyed and timid, hanging around the fringes of his new base, reluctant to handle his weapon. Now he wears a black balaclava rolled atop his head, and carries his AK with swagger: in one hand, swinging at his side. "This only ends one way," he tells me, staring up at the clouds. "They leave."